Get ready to earn your GED® test credential at no cost to you! Need to earn your GED® test credential so you can move ahead in your life? 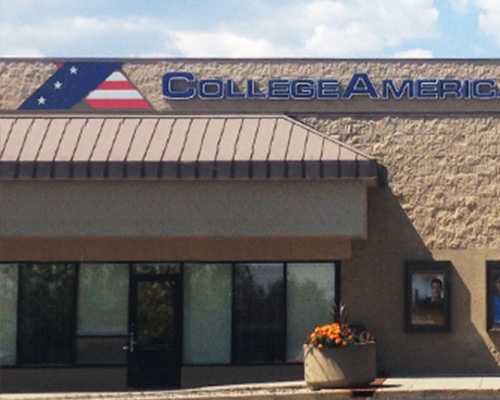 There’s only one place in Fort Collins where you can prepare for and take your test for $0, and it’s the Fort Collins campus of CollegeAmerica. The campus is an approved testing center of Pearson VUE®, so you can prepare for and take your GED® test all in one place! CollegeAmerica’s Good Neighbor Initiative provides everything you need to succeed. Call us or visit our campus today to learn more! Hours: M–Th, 9 a.m.–7 p.m.
Laura Farnham has been in education for her entire professional career. After getting her Bachelor’s degree at the University of Northern Colorado, she started out teaching high school English and speech. She’s very happy with her opportunity to help adults reach their goals of passing the GED® test and bettering their lives. "Passing my GED® test seemed impossible for years. With CollegeAmerica’s flexible hours and Laura there at every step, I finally graduated! Laura’s years of helping others graduate really sets you up for success. She knows how to explain the most confusing things in the simplest ways. The service is completely no-cost. It’s the best I’ve seen for anyone who needs a little extra help or motivation to pass their GED® test." Schedule your NO-COST GED® test course orientation today! Must be a U.S. citizen or legal permanent resident and at least 18 years of age. By providing us with your phone number, you consent to be contacted by Stevens-Henager College or its affiliated schools about their educational programs. This contact may be by phone, auto dialer, recorded message, or text. You may still attend without providing this consent. Be sure to arrive early! Latecomers will have to reschedule their orientation. GED® is a registered trademark of the American Council on Education (ACE) and administered exclusively by GED Testing Service LLC under license. This content is not endorsed or approved by ACE or GED Testing Service. These services are not within the institution's scope of accreditation. Restrictions may apply. To qualify for no-cost services, you must be a U.S. citizen or legal permanent resident and at least 18 years of age.